In our continued efforts to bring the most advanced technology available to our patients, The Draisin Vision Group is proud to announce the inclusion of the Optomap Retinal Exam as an integral part of your eye exam. Many eye problems can develop without warning and progress with no symptoms. Early on, you might not even notice any changes in your vision. However, diseases such as macular degeneration, glaucoma, retinal tears or detachments, as well as other health problems such as diabetes, high blood pressure, and high cholesterol can be detected with a thorough exam of the retina. The retina is the part of the eye that catches the image of what you are looking at, similar to the film in a camera. An overview or map of the retina, giving your doctor a more detailed view that can be achieved by other means. 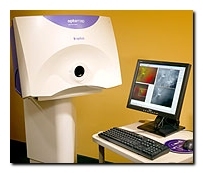 The Optomap Retinal Exam is fast, easy and comfortable. Please note: The Optomap Retinal Exam may be a non-covered service with your health plan, meaning you would be responsible for the charges. Your doctor strongly believes the Optomap Retinal Exam is an essential part of your comprehensive eye health examination and highly recommends it for all patients once per year.